It’s been a hectic month with exhibitions and shows to get ready for and consequently I’ve neglected the blog somewhat. Now that things have calmed down a little, I have found some time to sit down and write about the final stage of the whole ceramic process. This is the moment when all the weeks and months of hard work culminate in intense heat. Although the firing process is a combination of chemical changes and interactions, the work is still being created - the wood-firing doesn’t just fix the work, it alters the final piece with some quite interesting results and this depends on many factors which I will try and explain in this post. When I first started firing my wood-kiln, I was adamant that the whole process would be done with firewood from the beginning to the end. This would involve starting a small fire outside the firebox door late on Friday evening and over the course of Friday night and Saturday morning the fire would be slowly built up and moved into the bottom of the firebox. This would help to warm the kiln up slowly and drive any dampness out of the pots and the kiln structure. The firing was split into 4 hour shifts overnight with whoever was my firing buddy at the time. For this firing my usual helper Craig was unable to attend due to work commitments and so I had a frantic few days emailing and calling people last-minute to see if anyone could come and help. Eventually Janne came to the rescue. I had met Janne when I was staying down with Nic Collins and Sabine Nemett in Dartmoor a few months earlier. Both Nic and Sabine fire their work with wood and Janne has been helping them both for a few years with their firings. I used to raw fire so this stage was vitally important (raw firing is also know as once-firing as it omits the bisque stage). However, after a couple of firings I decided to use gas to warm the kiln up over night which would give me a chance to have a decent night’s sleep and have a clearer head for the day to come. I really can’t see much point in using firewood in these early stages - it doesn’t add much at all to the final work. It also means that I can make more informed decisions at the latter stages of the firing as I’m not as tired and suffering so much from fatigue or heat-exhaustion. I set up a a large gas burner in the firebox nearest the chimney (for the purposes of this blog I’ll be calling it the ‘opposite firebox’) at around 10pm on the Friday and set it on very low so as not to heat the kiln up too quickly - if the pieces heat too quickly they are liable to crack. Once I’m happy that it’s set to the correct pressure I head off to bed. I’ll get up at about 3am just to check the burner is still alight (sometimes if it’s windy the burner can be blown out, however there is a safety cut-off if this happens). The temperature inside the kiln is usually between about 80ºC and 100ºC at this point. Before heading back to bed, I’ll also increase the pressure a little to keep a steady increase in temperature so that by 7am it should hopefully be around 150ºC. Eventually a small ember bed has begun to build up in the front of the small gas burner and the gas can be turned off. Janne keeps the fire going in the front firebox while I work on getting an ember bed built up in the opposite firebox. I use the same method as before: move the burner back enough and start throwing small kindling in front of it and build up an ember bed. This gets moved into the lower part of the firebox and the gas turned off. By now the pyrometer reads around 350ºC. From now on we only use firewood. The firewood I use is a mixture of pine offcuts and slab wood from the local saw mill and old oak fence posts gathered from around the farm. There is also a pile of old pallet wood which gets used for the latter stages of the firing. For the most part, I’ll use pine for the firing however when it gets to the ‘reduction’ stage I start using some oak. The pine burns quickly, producing a burst of heat but with a longer flame which reaches deeper into the stack, whereas the oak burns slower producing heat for longer but with a shorter flame. The oak is better for building up embers due to its density compared to the pine. Careful choice of the type of timber and when to introduce it into the firebox is crucial to getting the temperature to rise at a consistent rate. Also, the fine tuning of the dampers and the air intakes can make a huge difference to how the kiln fires - I’ve learnt over the years that tiny 1/2 inch differences can mean either the kiln climbing in temperature or dropping. From the beginning of the firing the kiln atmosphere is ‘neutral’. This means that the fire is burning using oxygen which is introduced into the firebox and burns fairly cleanly. This is important in the early stages as it can adversely affect the clay, however once the temperature is about 900ºC (cone 010) then ‘reduction’ can begin. The combustion occurring within the kiln needs oxygen, but by starving the kiln of oxygen the fire looks for an alternative source of oxygen. 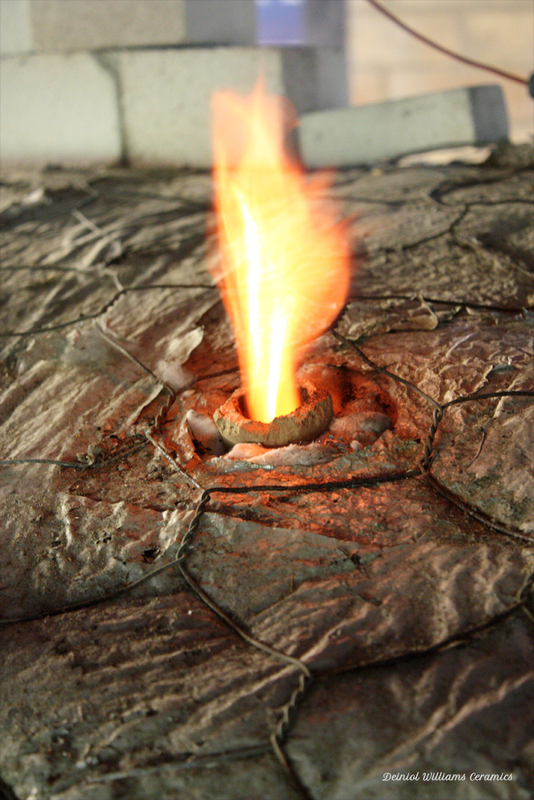 The easiest place for the fire to find oxygen is to seek out any small gaps in the kiln structure where it can access the oxygen rich air, however it can also utilise the oxygen molecules within the clay structure - slowly over a period of a few hours (depending on the thickness of the clay) this alters the clay. The clay changes colour from a warmer buff colour to a cooler grey/blue colour and will accentuate the glazes. As reduction continues all the way up to the top temperature of around 1295/1300ºC (cone 11) the reduction atmosphere alters the glazes in exactly the same process as the clay. The ash glazes react well to this reduction atmosphere and have a stronger more intense colour than if they were fired in a neutral atmosphere. I find the trickiest part of the firing is always towards the end. It is usually late on the Saturday night and it’s at this point that I’m glad I haven’t been up all night previously and can focus on the job at hand.Trying to get the temperature to rise gets increasingly difficult - I have to factor in the fact that the wood takes a certain amount of energy to begin burning before it releases heat from the burning of gases. However, while this is happening the kiln is also losing a certain amount of heat via convection on the exterior and also up the chimney. It becomes a fine balance of introducing enough energy into the kiln but without choking it and losing temperature. It turned out that the glazes looked stunning due to the runniness, however it did mean lots of cleaning up of the bases of the work. In the next blog post, I will show the unpacking of the kiln along with the messy aftermath of the runny glazes.